In the case of a disaster (natural or man made), a country is not only affected by the intensity of the disaster but also by it’s own vulnerability to it. Countries have different kind of opportunities to prepare for such catastrophes, to respond finally to start the recovery. Many less developed countries, e.g. Madagascar, are in particular prone to disasters, not only because of the higher probability of occurence, but also due to a potentially lower ability to cope up during and after the event. In this example we will focus on vulnerability in terms of access to health care. The access to health facilities can be highly unequal within a country. Consequently, some areas and communities are more vulnerable to disasters effects than others. Quantifying and visualizing such inequalities is the aim of this notebook. 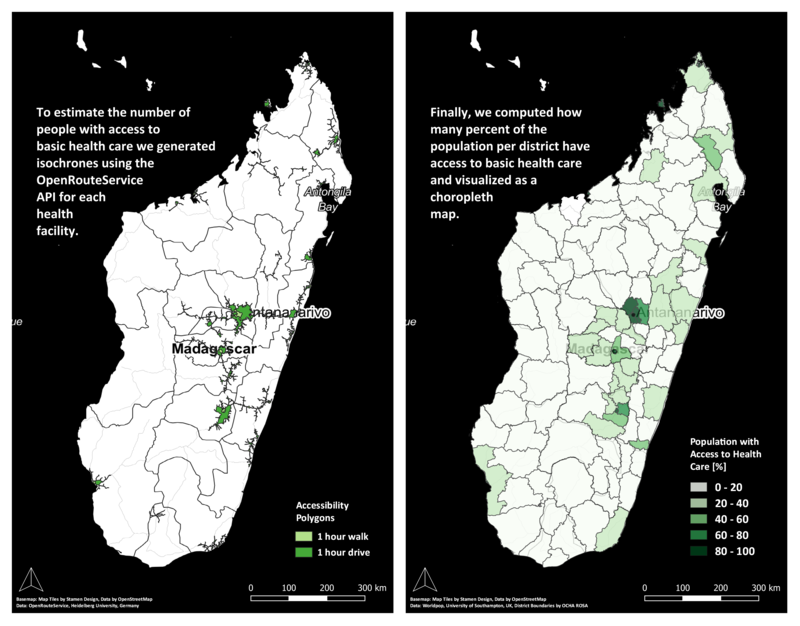 The notebook gives an overview on health sites distribution and the amount of population with access to those by foot and by car for Madagascar. 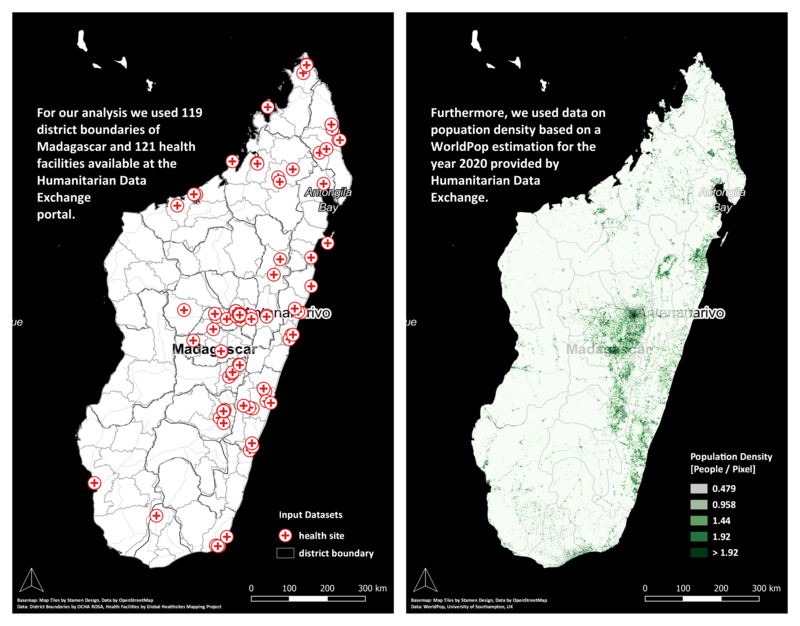 Open source data from OpenStreetMap, the Humanitarian Data Exchange platform and tools (such as the OpenRouteService) were used to create accessibility isochrones for each hospital and to derive analysis results about the population percentage with access to health facilities per district. The findings show that the inhabitants of 69 of 119 (58%) districts don’t have any access to hospitals in an one hour foot walking range and those of 43 of 119 (36%) districts in an one hour car driving range. Preprocessing: Get data for districts, health facilities, population density, population count per disctrict. Analysis: Compute accessibility to health care facilities using OpenRouteService API, Derive the percentage of people with access to health care per district. Results: Visualize results as choropleth maps.